Kagoshima, the land of the sweet potato (satsuma imo) and home of imojochu (sweet-potato liquor), is perched on the southern tip of Kyushu. Endowed with lush, verdant vegetation, sweeping ocean views, rivers, hot springs, mountains, and of course, that hot-tempered volcano – Sakurajima, it makes the perfect destination for a long-weekend escape. What’s more, Kagoshima has been voted Japan’s friendliest city, and you only have to spend a day there to see why. So, pack a suitcase and your camera and fly south this winter for a few days of adventure and a drink or two with the locals. Meander through the traditional Japanese garden and UNESCO World Heritage site of Sengan-en. With the volcano Sakurajima as its backdrop, this stately residence and picturesque landscape garden dates back more than 350 years when it was created by Shimadzu Mitsuhisa, who ruled the area in those feudal times. Regular guided tours take place where guests can enjoy the private inner garden while drinking matcha and eating traditional Japanese sweets. Getting there: There’s a bus loop between Kagoshima Station and Sengan-en. A taxi ride takes about 10 minutes. Over thousands of years, Kagoshima’s landscape has been shaped by one thing – the towering active volcano of Sakurajima. Rising above sea level at 1,117 meters, the still-active volcano dominates the view from nearly every angle within the city. From Kagoshima port, you can take a short ferry ride across to the volcanic peninsula. There is a bus tour that ferries visitors around the 77 km base of the volcano stopping at all the top lookout spots for marvelous views of the mountain and across the bay of downtown Kagoshima. Getting there: Kagoshima port is accessible by bus, tram, or taxi. Treat yourself to the best of Kagoshima cuisine, also called Satsuma cuisine, in the bustling web of alleyways known as Yatai-mura (“food stall village”). Try Satsuma age (fried fish cake), tonkotsu (slowly stewed pork chops), or the much-loved kurobuta (black pork) in one of the many hole-in-the-wall eateries. Don’t forget to chat up the friendly locals while you’re at it. At Meijigura Distillery, the shochu-making process hasn’t changed for more than a hundred years. This distillery, which has been around since the Meiji era (1868–1912), still uses the same brown clay pots and wooden barrels as when it first opened. Distillery director Kazuto Kukino will take you on a tour of the facility and have you sampling the goods in no time. Getting there: From Kagoshima-Chuo Station, take the JR Ibusuki Makurazaki Line to Makurazaki Station. Walk five minutes to the distillery. Located in Ibusuki is a special stretch of beach that is naturally heated by a hot spring. Called the Sunamushi Onsen Sayuri sand bath, this is a phenomenon unique to Kagoshima and has been clinically proven to be beneficial for detoxing and boosting circulation. 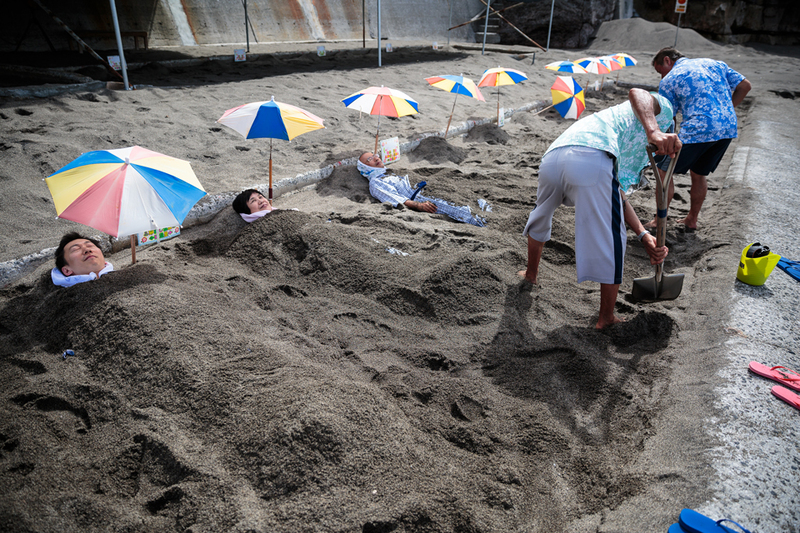 Face up, and covered up to the neck in hot, black sand, temperatures reach between 50 to 55°C. Allow bar owner and shochu connoisseur Yuichi Ikehata to pour you a digestif at the stylish Shochu Bar Ishizue. The sleek, wood-panel bar has hundreds of bottles of imojochu lining the walls. With 13 distilleries and more than 2,000 different brands of shochu in Kagoshima alone, there is a seemingly endless variety to choose from. You might feel like a fish out of water in this smelly place (or being awake before 7am! ), but it is certainly worth the early-morning alarm to see the Kagoshima Fish Market in action. There is an English tour run by a local hotel association which will take you through the hustle and bustle where you can see live fish auctions, eat fresh tuna straight off the bone, and enjoy the freshest sushi breakfast going at the market restaurant. Watch masters at work at Iso Kogeikan, a Satsuma Kiriko cut-glass workshop. Satsuma Kiriko is a form of overlaid crystal glass that first appeared in Kagoshima around 150 years ago when Japan opened up for trade with the West. Skilled craftsmen meticulously cut away at the delicate layered glass creating beautiful dishes, glasses, and bottles that can be bought in the adjoining shop. Look no further than restaurant Ichi Nii San for a kurobuta (black pork) lunch. Located in the heart of downtown Kagoshima in the Tenmonkan shopping arcade, order the recommended lunch special: thin slices of boiled pork served with rice and vegetables. Walk it off with souvenir shopping in the arcade, and don’t forget to stop off at Tenmonkan Mujaki for some Shirokuma shave ice – a sweet, refreshing local dessert. Peach flies to Kagoshima three times a day from Kansai Airport.